More Canberrans are purchasing microchips to implant in their bodies containing credit card details and security passes. A convicted hacker is selling implantable microchips able to store data including credit card details, and more than 100 Canberrans have signed on to the new technology. Chip My Life, an Australian company which imports the technology and sells it domestically, has sold more than 100 microchips to ACT residents since operations began in 2016. The microchips are the size of a grain of rice and are implanted into the webbing between the thumb and forefinger in a procedure that takes less than a minute. The procedure can be carried out by specialists in Sydney, and a Canberra-based clinic is slated for the coming months. The company’s co-founder, a convicted hacker, Skeeve Stevens said interest had surged in the national capital for the technology in recent years. He said the microchip was inserted into the webbing between the finger and thumb because the area had fewer pain nerves. In 1995, Mr Stevens was sentenced to three years in prison for stealing and publishing the credit card numbers of 1200 AUSNet subscribers. At the time, his defence for the hack was to highlight flaws in the AUSNet network. Mr Stevens laughed off privacy concerns about his business, saying the conviction didn’t seem to matter in other parts of his career where he speaks to government departments about the implications of new technology. He said he does not have access to the data being placed on the chips. While the company provided the microchip, users were responsible for inputting their personal information. “In the three years we’ve been going, we’ve sent out around 1600 microchips,” Mr Stevens said. “We don’t know what people do with the chips once we send it to them,” he said. Mr Stevens is among those who have an implanted microchip. His holds codes for his front door and garage at home. He said the majority of microchip users use the technology to store data normally found in swipe cards. “Some of the chips use the same technology as swipe-card technology in that it holds a single serial number to open something like a garage door. The increase in the number of people using the microchip technology comes as a recent report showed attitudes towards the implants are shifting. 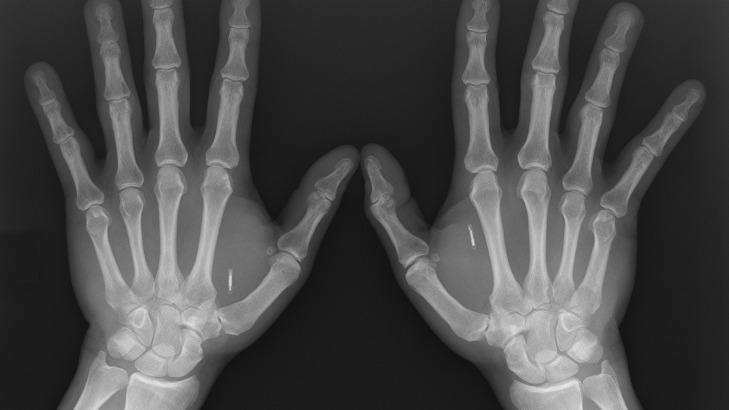 The Australian Institute of Criminology report showed out of almost 10,000 people surveyed, 9 per cent said they would be willing to implant a microchip under their skin to make their data more secure. However, respondents who had a been a victim of their personal information being misused were more willing to use the microchips, with 14 per cent saying they wanted the implant. In 2017, 2.6 per cent of those surveyed said they had already used the technology. University of Melbourne professor of human computer interaction Frank Vetere is part of a research team looking into why people are choosing to implant microchips in their bodies. He said the technology had been around for almost 10 years, but uptake of the microchips among the general population had been relatively small. “There has been a strong uptake of this, but the numbers are still quite small. It’s definitely not a flood of people,” Professor Vetere said. Professor Vetere said the technology was not overly advanced and was restricted to security passes and medical information. He said it had a long way to go to become more commercially viable. “It’s mostly just a storage chip,” he said. Professor Vetere said Australia was behind other countries in using the technology, with many in Sweden using the microchips as travel passes on its public transport network. In 2017, a Sydney man was fined by NSW Transport for having an Opal card chip embedded in his hand. Bio-hacker Meow-Ludo Meow Meow was fined for failing to produce a valid ticket, because he had the Opal card chip inside his body. The conviction was overturned, although Mr Meow Meow had to pay $1000 in legal fees. Posted on April 3, 2019, in ConspiracyOz Posts. Bookmark the permalink. Leave a comment.